Glasscape is a reinterpretion of the classic fishbowl, transforming the basic home item into a beautiful new icon. The textured interior is made of hand blown glass, evoking the feel of an underwater landscape or rugged terrain – creating the perfect environment for plants to pets alike. Winner of a 2011 International Design Excellence Award (IDEA) from the Industrial Designers Society of America (IDSA), the Fishscape features an elaborate underwater landscape created by organic-looking bulges, making the glass bottom seem to rise from the water like an oceanic ridge. This innovative design harmoniously combines light and shadow to create a modern, yet functional home for goldfish, beta fish, and other small-scale marine life. Fish are of course not included. Glasscape Glass Fish Bowl by Arulide. The most beautiful modern fish bowel ever! This exquisite hand-blown glass fishbowl—which also doubles as a terrarium—won the vaunted International Design Excellence Award (IDEA) in 2011. The underwater glass mountain landscape uses light and shadow to create a beautiful home for the aquatic and terrestrial alike. 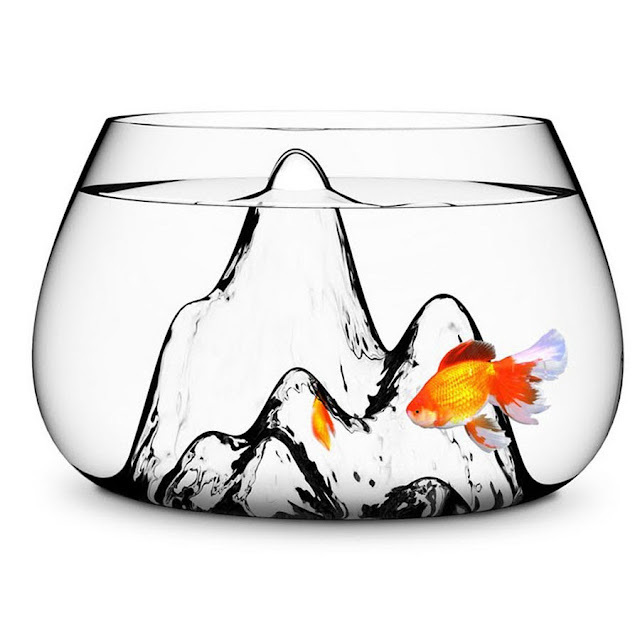 With Glasscape, New York product design consultancy Aruliden transforms the traditional fishbowl into an attractive abode for piscine pets. This handsome hand-blown glass piece features a mountain-like form that provides a unique focal point. For those who are more inclined to grow a capsule garden than live the life aquatic, the bowl also serves as an equally alluring vessel for a terrarium.